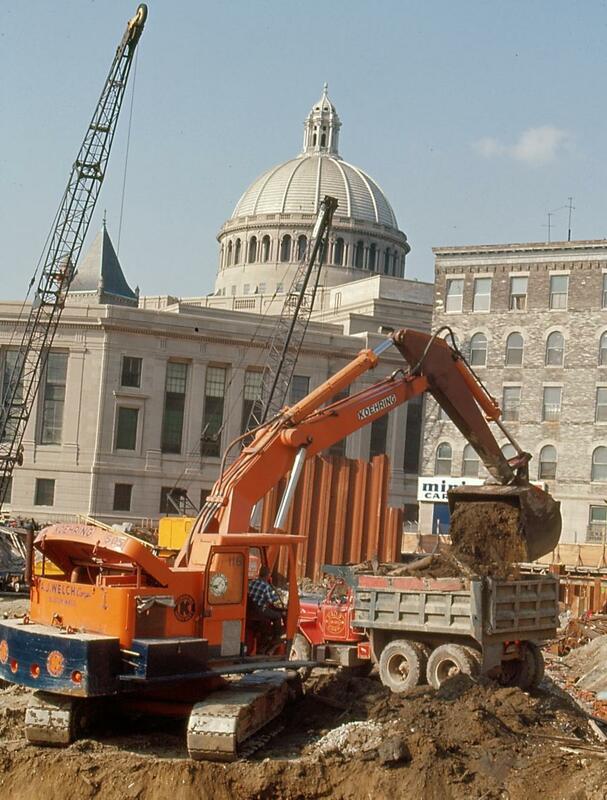 Edgar A. Browning Photo A. J. Welch Corporation uses a Koehring 505 hydraulic hoe on this Boston, Mass., building construction site in 1969. Welch purchased one of the first Koehring 505s sold in New England. It's hard to imagine, but there was a time when cable machines were used exclusively for excavation in general construction work. An American engineer by the name of William S. Otis invented the steam shovel in 1835. The machine mechanized the motion of a laborer digging with a hand shovel. By the 1930s, while still a cable-operated machine, many refinements had been made. Steam power had been replaced by gas, diesel and electric. The machines were fully convertible from shovels to hoes and cranes. The versatility resulted in extended use of this capital investment. Skilled operators were at a premium and commanded some of the highest wages on a project. The shovel operators had achieved such a level of prominence that the construction industry trade journal project accounts of the day would name shovel operators alongside those of the project superintendents and managers. Gradually, some construction machinery implements began to be actuated by hydraulic controls, i.e. bulldozer blades. Shovel dozers, wheel and backhoe loaders, and other complete hydraulic machines followed. However, contractors largely used these machines in utility or complementary roles. Methods began to change in 1963 with Koehring's launch of the model 505 hydraulic hoe. Koehring advertised the machine as the world's largest hydraulic hoe. The large machine equipped with a 2 cu.-yd. (1.5 cu m) bucket quickly gained acceptance with sewer and pipeline contractors. The machines operator control and ability to trench beneath and around utility laterals far surpassed that of cable machines. They were easier to operate and move. An October 1964 issue of the New England Construction magazine contained an ad for the Koehring dealer, Parker- Danner Co. in Boston, Mass. The ad featured contractor, A. J. Welch's use of their new Koehring 505 hydraulic hoe on the $2.6 million Chicopee Falls Local Protection (Flood Control) Project. A. J. Welch was an excavation sub for Daniel O'Connell's Sons. Quoting the ad, the big Koehring was digging a channel in the Chicopee River at Chicopee, Mass. The river bottom was bedrock. A cable machine was unable to break the suction of the boulders. The 505 hoe, using its full 53,000 lbs. of breakout force, was able to dislodge the boulders. A. J. Welch remains a prominent Boston contractor today with 65 year legacy of success. 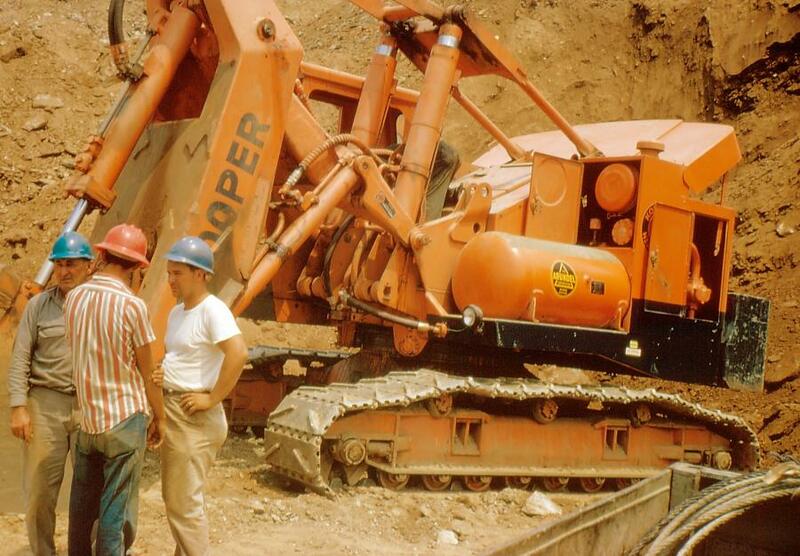 The first heavy duty front shovel, the Koehring model 505 Skooper, also was released in 1963. It received considerable market acceptance in New England. Large Connecticut roadbuilders, Arute Bros., White Oak Excavators, and C. W. Blakeslee were among those who owned them. They were used in many applications from borrow pits to quarries. The machine was rated between 4 to 5 cu.-yds. (3 to 3.8 cu m). At times they were used alongside the large cable shovels like the Northwest 180-Ds owned by White Oak Excavators of Plainville, Conn.